As a new year begins, many of us take time to reflect on the old year and set goals for the new one. On a personal level, I defined 2011 as a year of disappointments and hope, and 2012 as the year of perseverance and faith. Just the other day, I found a short note that I wrote exactly a year ago, that I could define as a short poem, but also a prayer and a statement of a wish I wanted to come true. I don’t know if the fact that I wrote it down engraved this prayer in my heart and increased my belief, but that prayer came true a few months later. It is usually recommended to “write down your goals and assign a timeframe to each one” and set goals that are “SMART—Specific, Measurable, Attainable, Relevant and Timely” (it is thought that the term was first used in a 1981 article by George T. Doran). I must admit that I have rarely done this on a personal level in my life (more for my career goals or my business plan). Rather, I set a personal goal in my mind (usually this comes up around the New Year) but I discuss it with my husband, I share it with my close friends and family, I pray about it and regularly check my progress. If you had one word to define your year 2012, what would it be? 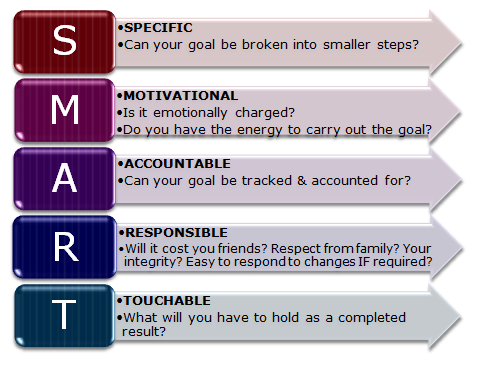 Have you set goals for 2013, and if yes, did you write them down? Do you set professional goals only, or also personal goals? Quels que soient vos objectifs ou désirs pour 2013, je vous souhaite qu’ils deviennent réalité. Mais surtout, que vous ayez la force et la détermination nécessaires pour persévérer dans vos efforts !